Naryan’s interests at BrainGate focus on enhancing 3-dimensional neural control of robot prosthetic limbs. 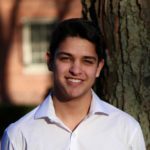 His undergraduate research is exploring the use of tactile sensors and wearable vibrational motors to augment control by creating a sensory feedback loop. Naryan will graduate in 2018 with an Sc.B. in Mechanical Engineering and Neuroscience.